Promote a Capella singing in the region among men of all ages. Establish itself as a source of high performance harmony singing within the Hunter Region. Promote fellowship, fun and achievement for members, together with family involvement and community spirit. Raise funds for Ronald McDonald House in Newcastle. 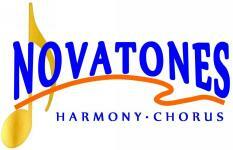 Under the expert directorship of Peter Donald, Novatones offers a high quality singing experience that is enjoyable and unique. It is exciting music, with a texture and colour that is also pleasing to the ear and to the soul. We offer a range of vocal entertainment options for prospective clients who are looking for a unique entertainment experience. For more details, visit our web site, or contact our representatives mentioned below. Novatones are a group of around 35 men with a depth of experience in a Capella singing (singing without instrumental sound). Five members of the group have been performing in Barbershop choruses and quartets for more than 15 years. Their love of singing in 4 part harmony was the catalyst that started the chorus in 2008 and since then the group has expanded with enthusiastic new members from Newcastle and neighbouring towns. There has been a concerted effort to develop a quartet culture within the club, and we now have 4 active quartets. The chorus regularly sings at venues around Newcastle, Maitland and the Central Coast, particularly carols in December. We also have singouts in Hamilton or Honeysuckle precincts, for the love of singing but also to raise money for Ronald McDonald House (Newcastle). In the past, we have sung at a Town Hall prize presentation, and hold concerts once a year,. For the past three years we have been invited to participate in the evening of Carols at the Sacred Heart Cathedral, Newcastle. The chorus has attended the past 4 National conventions, winning the Most Improved Chorus trophy in 2013. The club also hosted the highly-acclaimed 2016 Nationals in Sept 2016 at the Newcastle Town Hall and at Wests City Club in Newcastle. In excess of 400 singers attended for the 5 days of the Convention and enjoyed som wonderful Newcastle hospitality.